A collection of upbeat, educational songs for kids and families. BIRMINGHAM, Ala. - Oct. 17, 2017 - PRLog -- Center Sound is proud to announce the release of Miss Robin's Musical Farm by Grammy Award Winning singer, songwriter, and multi-instrumentalist Robin Ruddy. 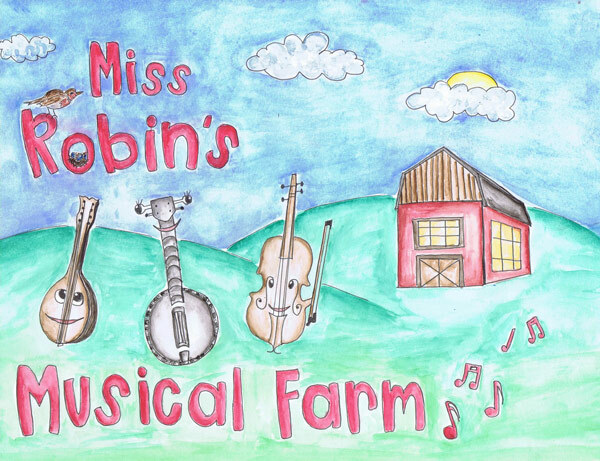 Miss Robin's Musical Farm is a collection of upbeat, educational songs about musical instruments. Each song features a different stringed instrument, and allows children to hear what each one sounds like while learning something about the instrument itself. These catchy songs were originally created for the Country Music Hall of Fame Musical Petting Zoo in Nashville TN, and have delighted children from all over the world. Center Sound Exec VP Craig Brandwynne says "After hearing the songs for Miss Robin's Musical farm as they were being recorded I thought that the concept and the songs were perfect for a children's project. This is a great fit for our label and we are thrilled to have Robin Ruddy as an artist on Center Sound Records. Robin Ruddy, originally from Miami, FL, won a Grammy Award in the category of Best Traditional Folk Album in 2004 for her involvement on "Beautiful Dreamer; Songs of Stephen Foster." Robin has toured with Rod Stewart and Lynn Anderson and has also worked with Shania Twain, Ray Stevens, Vince Gill, David Ball, Terry Clark, and Deborah Allen. Robin's songs have been recorded by The Darlins, Savannah Lynne, Sarah Alison Turner, Holland Marie, Tim Watson, Emma Leigh, Kelsey K, Wade Trammell, Kim & Kandy, and is also the author of two books: "Coconuggets, 10-Secrets to Success in a Coconut Shell" and a banjo instructional book called "The Ruddy Method - Beginner Banjo." Center Sound Records was founded in 2007 to provide independent and developing artists a wide array of services, including marketing, production, recording, publishing, management & licensing. Center Sound also offers audio and video post production services to a variety of clients. Center Sound's goal is to provide it's artists with a 'menu' of services for them to choose from. Center Sound's staff will tailor these services to meet each artist's specific needs to help them advance their career. Center Sound Releases Robin Ruddy's "Miss Robin's Musical Farm - Kookie Bouzouki"